I had the idea for Poison when I was backpacking around the Far East. As sometimes happens when a book takes shape, it was the final scene that I first thought of, and I worked my way back from there. But even though I had the story in my head, it was over a year before I began actually writing it. The book that was to become The Weavers Of Saramyr was monopolising my time, and I was juggling that and writing the script for The Haunting Of Alaizabel Cray. My deadline for Poison crept closer and closer, and then sneaked past and away, and finally I couldn’t leave it any later so I began working on this in between editing drafts of Weavers and Alaizabel. It’s difficult to say anything about the roots of the story in Poison without giving away the entire point of the book. I didn’t want to write another action-filled, breakneck-paced story like my previous fantasies. There was a very conscious determination with Poison to ensure that the lead character was utterly powerless in the face of her enemies, so that there was no question of being able to physically beat them. In Poison, the characters live on their wits alone, perpetually overmatched. I like that; much more like real life. I think, as one reviewer commented, that it’s a much more thoughtful book than its predecessors; there’s a lot of deeper subtext and symbolism beneath the picaresque thrust of the storyline. It can be read one level as a weird, gruesome kind of fairy tale, but there’s a lot more to it than that. I spent most of my time writing this novel worrying about whether anyone would ‘get’ it, or whether it would sound like some degenerate A-Level student’s philosophical rant when it was all finished instead of the story it was supposed to be, but I think it all worked out fine in the end. I’m very happy with it, anyway. And at least I got to put all the folklore I studied at University to good use. 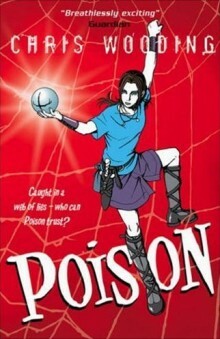 Poison won a bunch of awards, including the LCC Children’s Book Of The Year Award and even one from the Dracula Society for Best Gothic Novel of 2004.